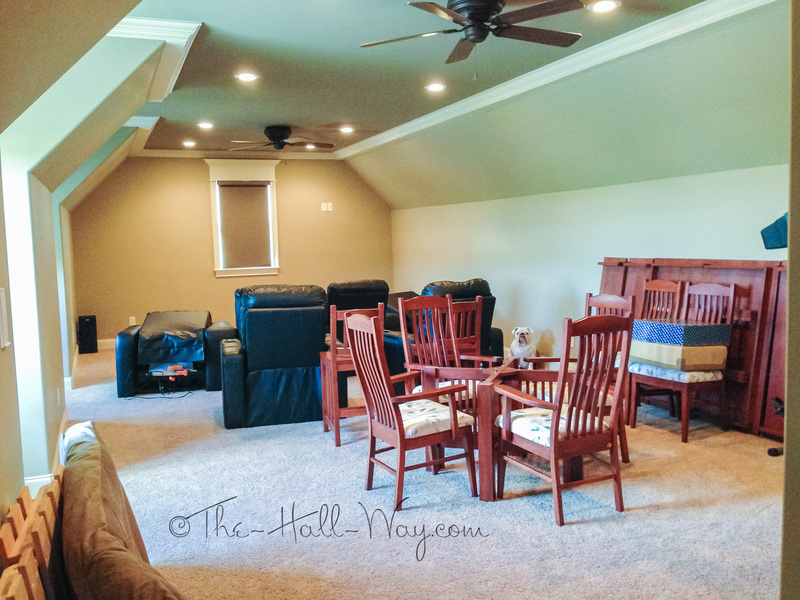 Since we moved in, our bonus room over the garage has been mainly used as a storage unit for us and my parents. It still houses my parents’ home theater chairs, our exercise equipment, random furniture and assorted boxes we cleared out of our real storage unit. Here are some pictures from before we moved in. 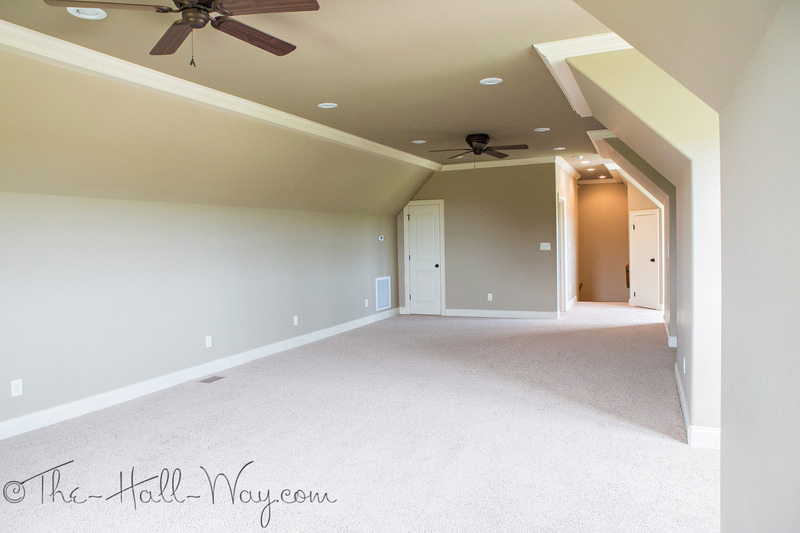 The door on the left is attic access. 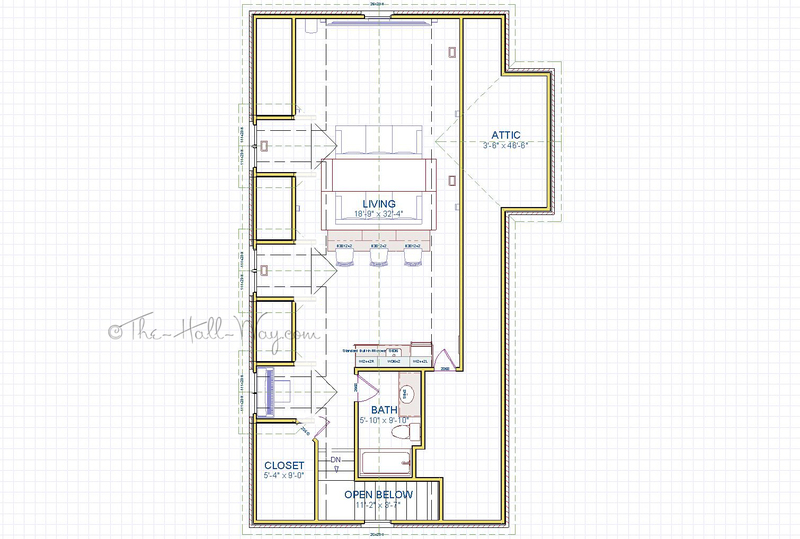 The bathroom door is in the middle of the picture and the door on the right is a walk-in closet. There is a full bath up there and it’s pretty large. The shower will probably never be used, but I wouldn’t get rid of it for resale reasons. 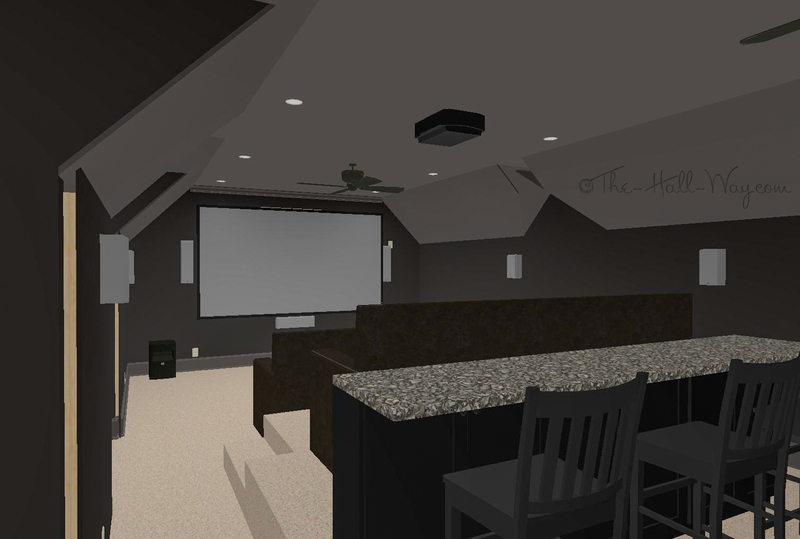 My “vision” for this room has always been a home theater, so I finally sat down and started working on a design recently. 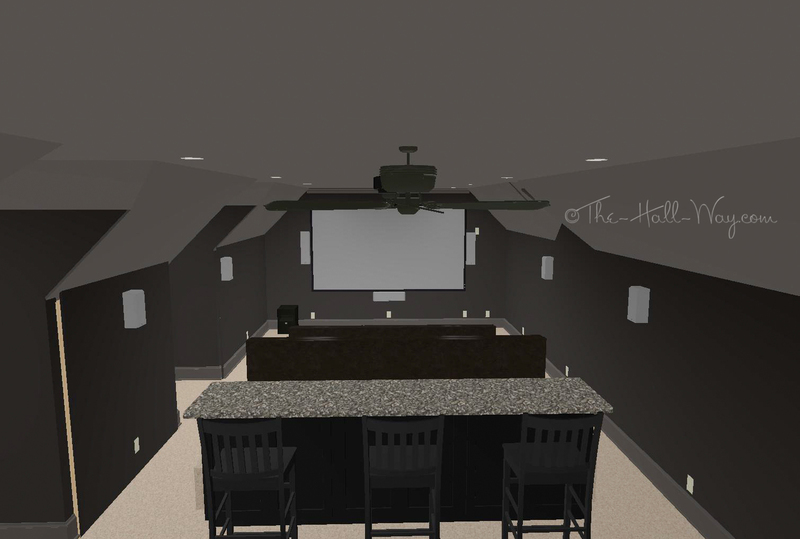 The hardest part was getting the program to draw the roof/ceiling correctly. I finally got it as close as it’s gonna get. 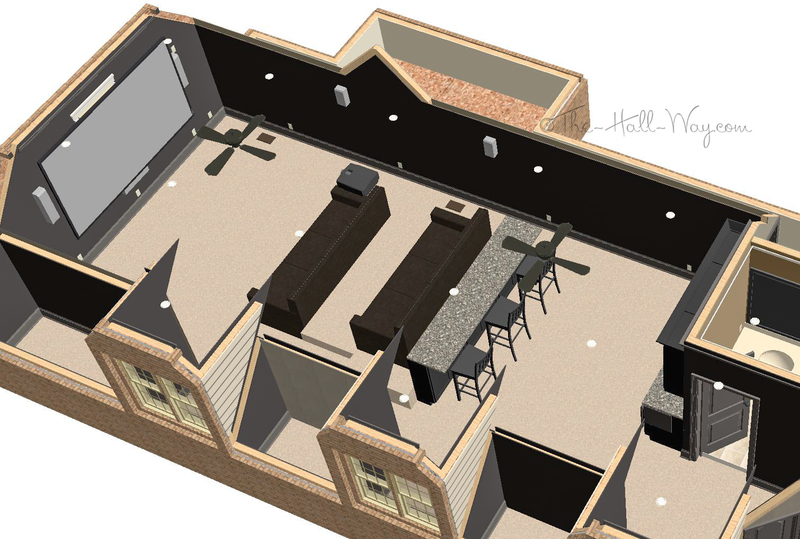 Then, I was able to start adding furniture and other details. 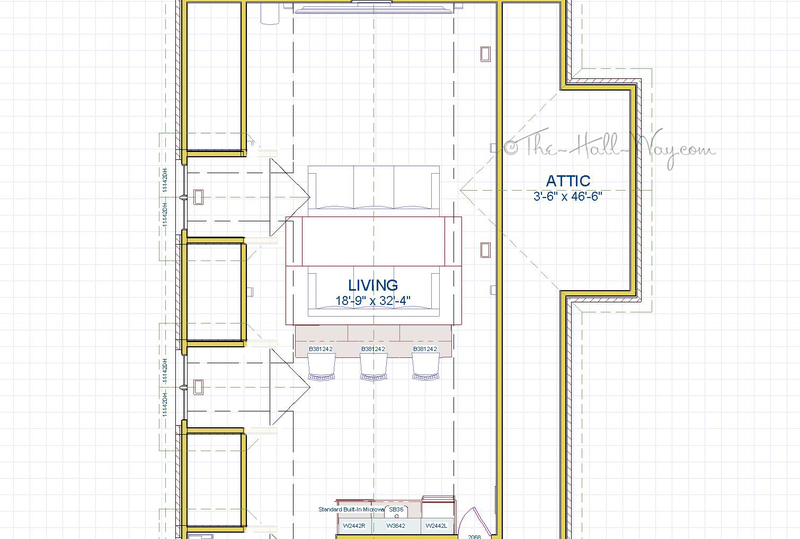 I should note that the only accessible attic space is a 2-3′ wide area along the side of the bathroom. 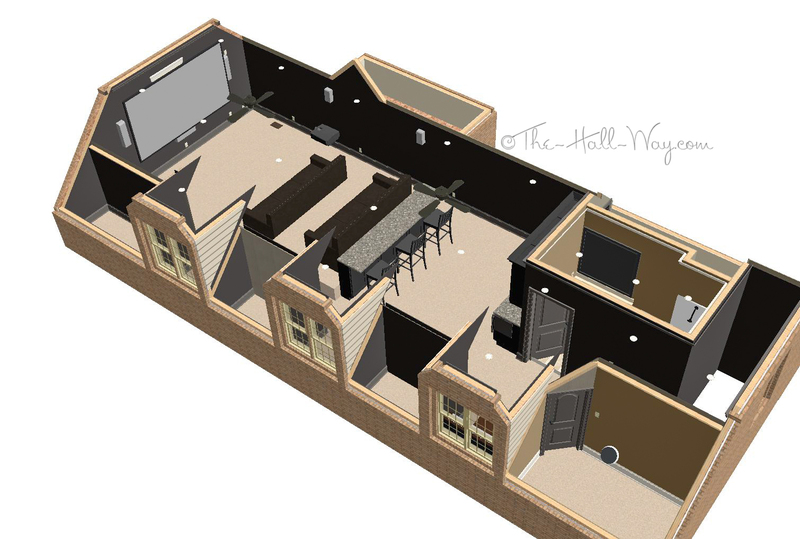 Imagine the long right wall of the bonus room continuing all the way to the staircase wall. The piano shown in the bottom dormer is the electric piano my parents gave us as a wedding present. My sister had it for a while after we got our grand piano, but we have it back now that she has my parents’ upright piano. The rectangles near the walls are floor registers. 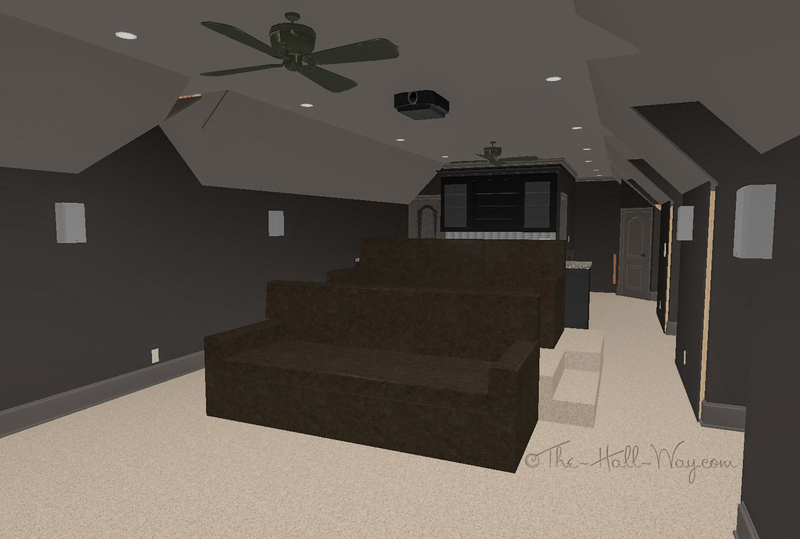 The seating is drawn above as sofas, but they’d be actual home theater chairs with 3 recliners per row. The second row is shown on a riser. 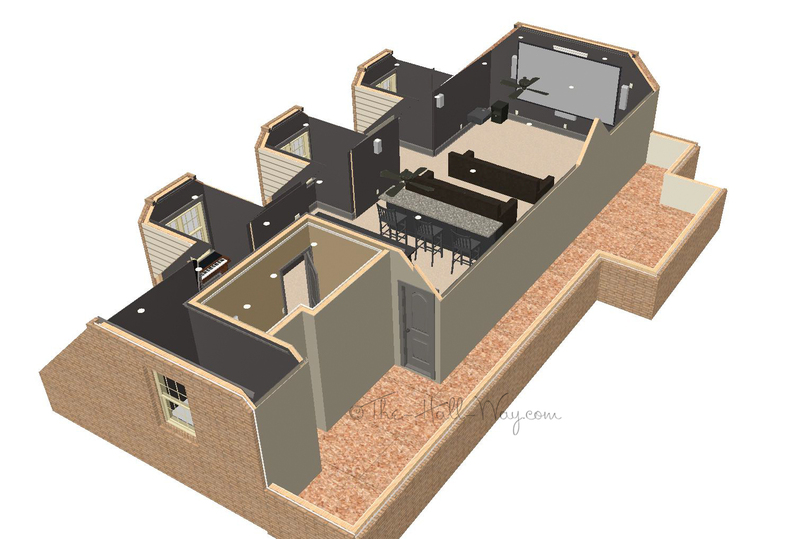 Here are some “doll house” views. The little white dots are existing recessed lights. You can also see the existing ceiling fans suspended in midair. At least one of those will probably have to go as it will likely interfere with the projector. 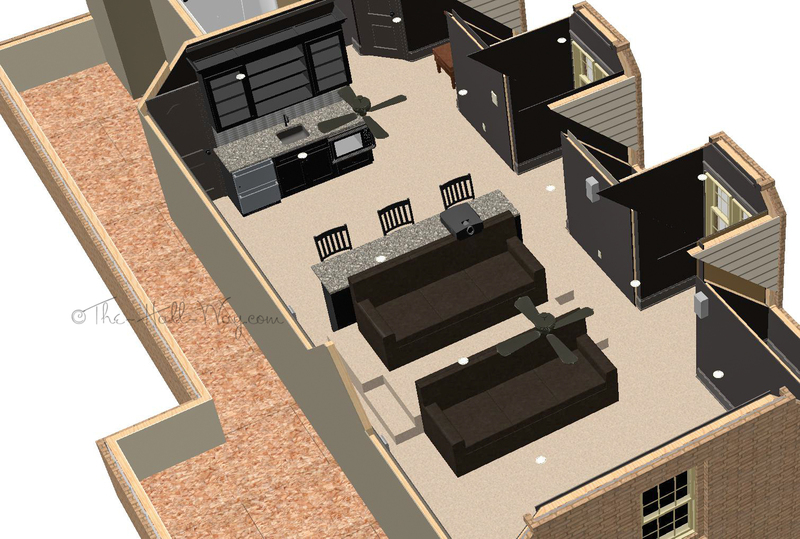 The bathroom and closet are shown in their current colors. 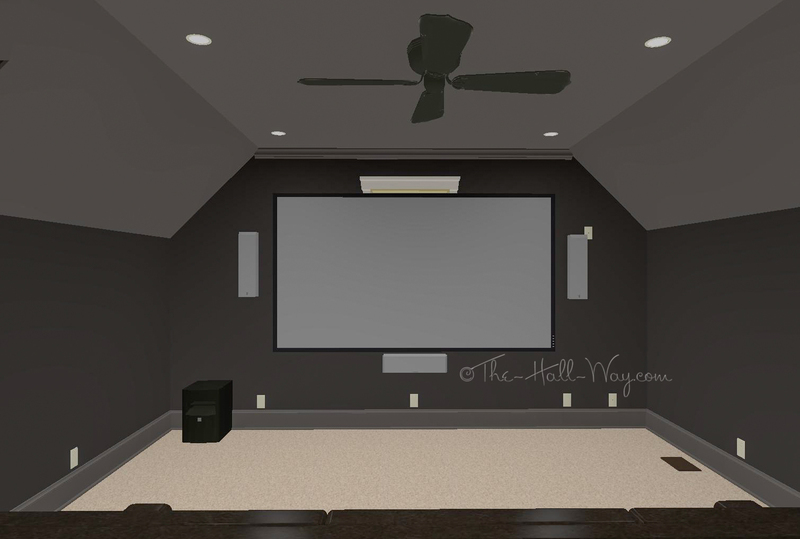 I randomly picked the theater room colors just to have something dark for the renderings. I still have no idea what direction I want to go with colors or decorating. 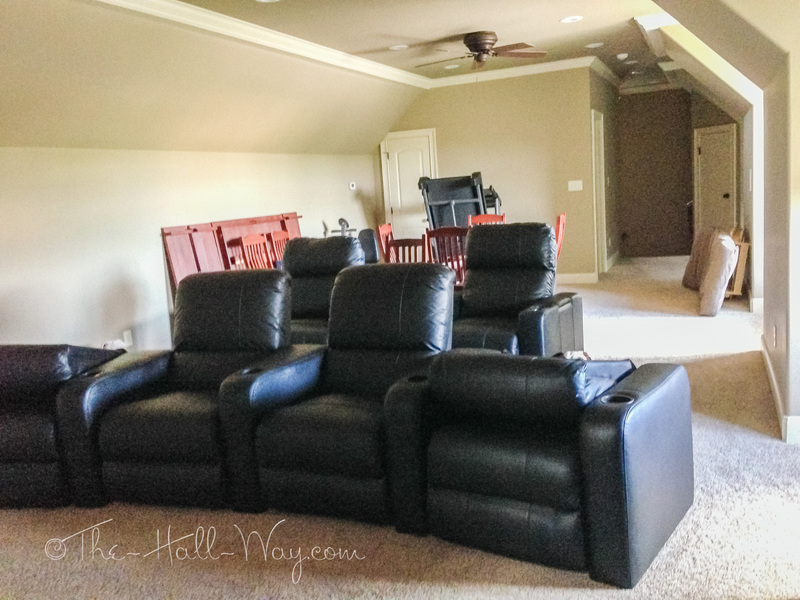 I do know the recliners will almost definitely be black leather. Behind the second row, I’d like to have a bar. I know from experience in my parents’ old home theater that eating in a big recliner, in the dark, isn’t the easiest thing to do. 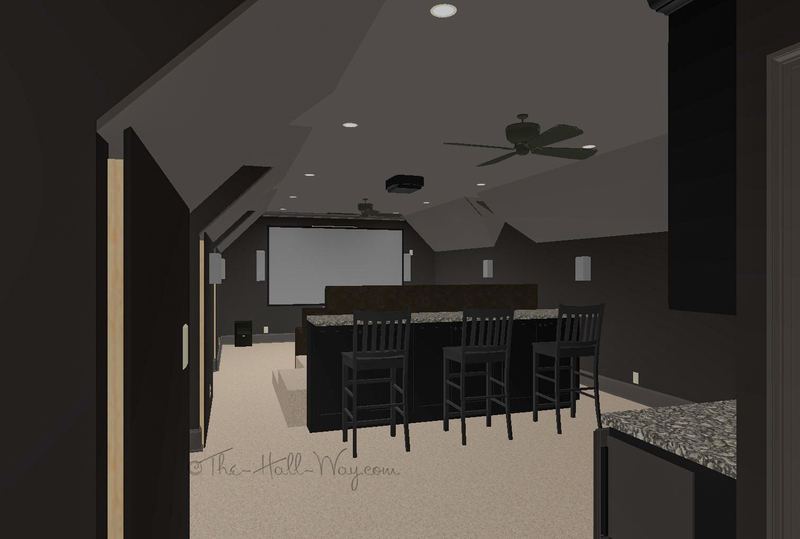 The bar would also give us additional seating, if needed. I need to work on the riser and bar design on paper so I can see how the heights will all work together. On the back wall, I’ve added a wet bar with fridge drawers and a microwave. 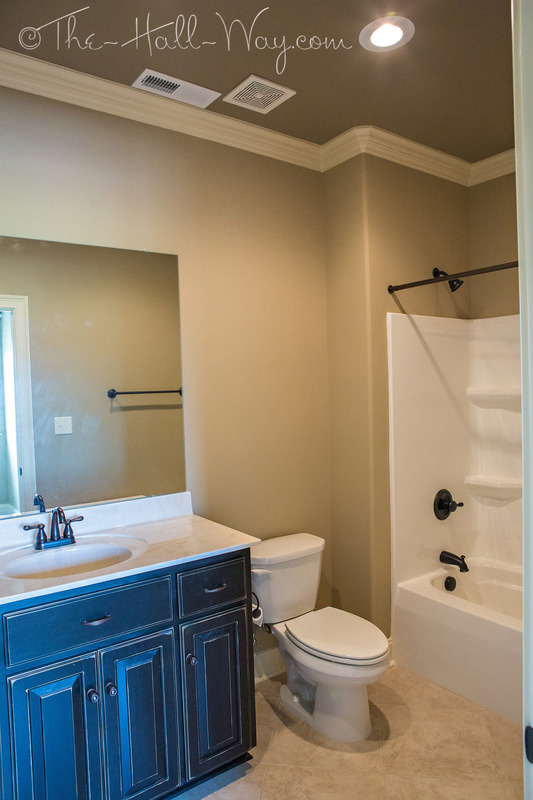 Plumbing for the sink should be relatively easy as the bathroom sink is on the other side of that wall and the plumbing is accessible from the attic access to the left of the bar. 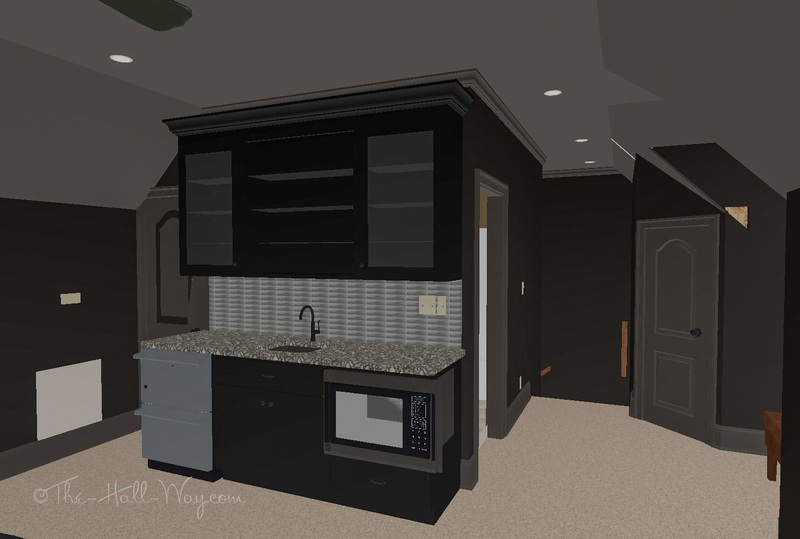 Again, I have no idea on the cabinet, countertop or backsplash colors yet. 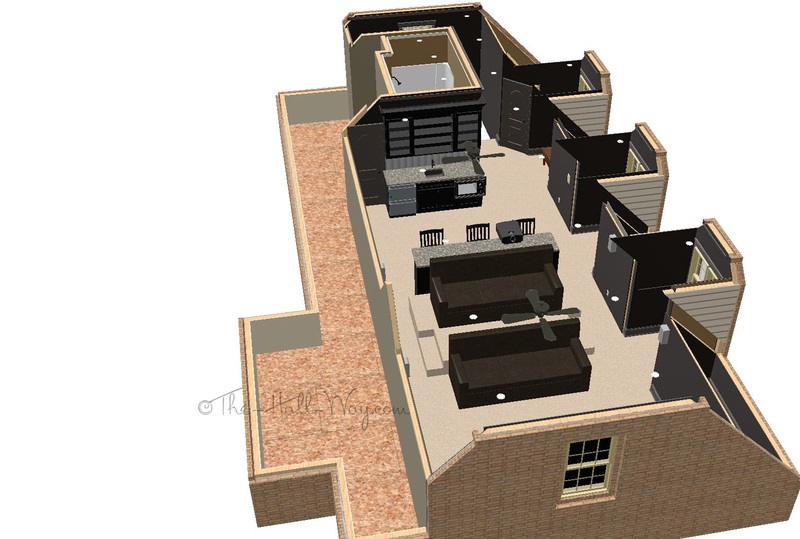 Finally, here are some 3D views. The dormers have my walls messed up a bit which is why you can see the studs along those walls. This first image is standing near the top of the stairs outside the bathroom door. The sloped areas are actually part of the walls, but the program considers them part of the ceiling. The slopes would actually be the wall color. The triangle along the right wall isn’t really there either. 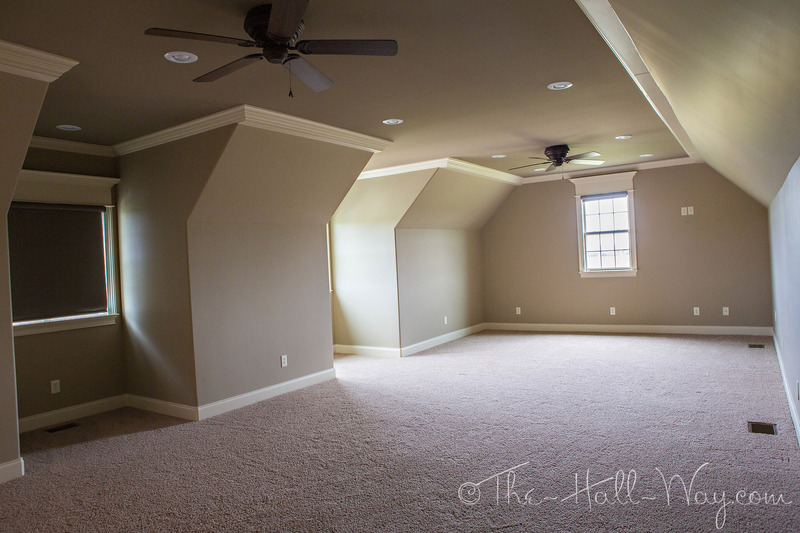 The ceiling is 9′ and the side walls are 6′ tall. 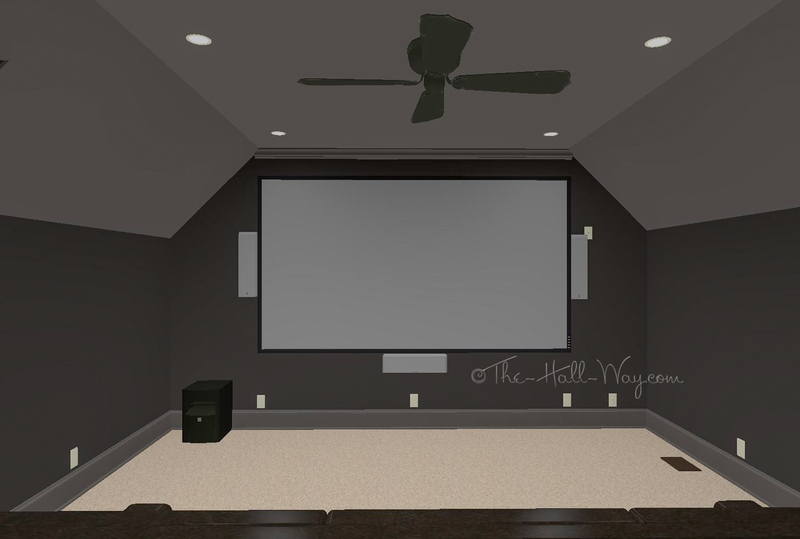 Below shows a 120″ screen. 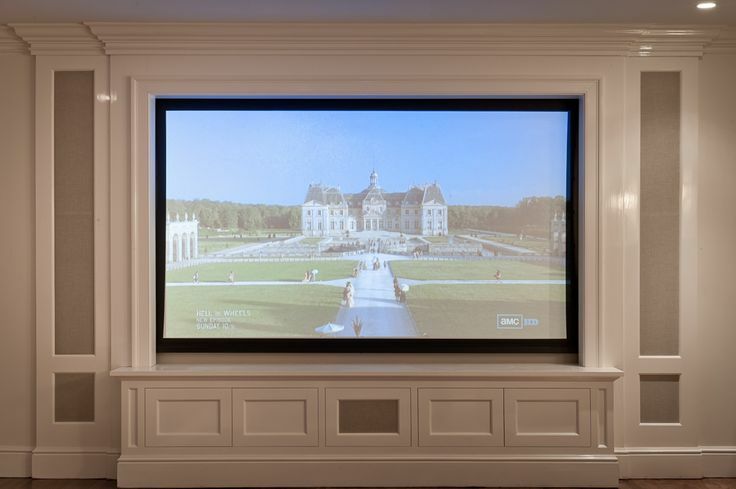 Or, here is a 132″ screen. Speaker placement is TBD, but they are all shown to scale (and they are really silver). 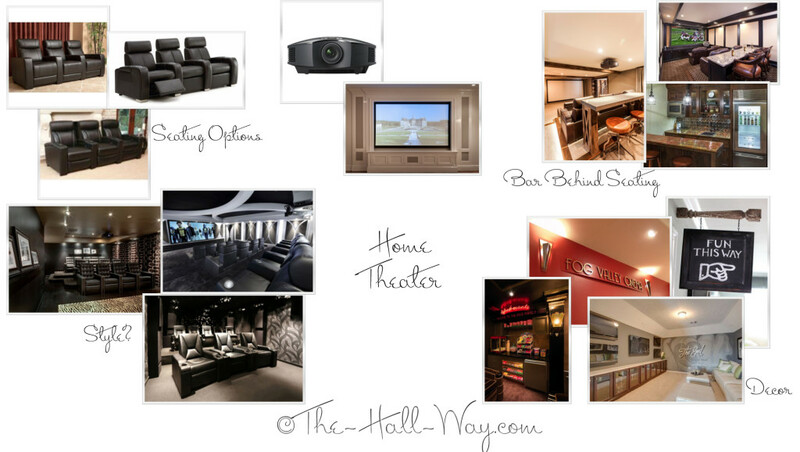 I threw together a design board to show some of my ideas from my Pinterest boards. I’d like to do some sort of Theater sign above the staircase door downstairs. Maybe an “Enjoy The Show” sign on the staircase going up and an “Exit” or “The End” sign going down. 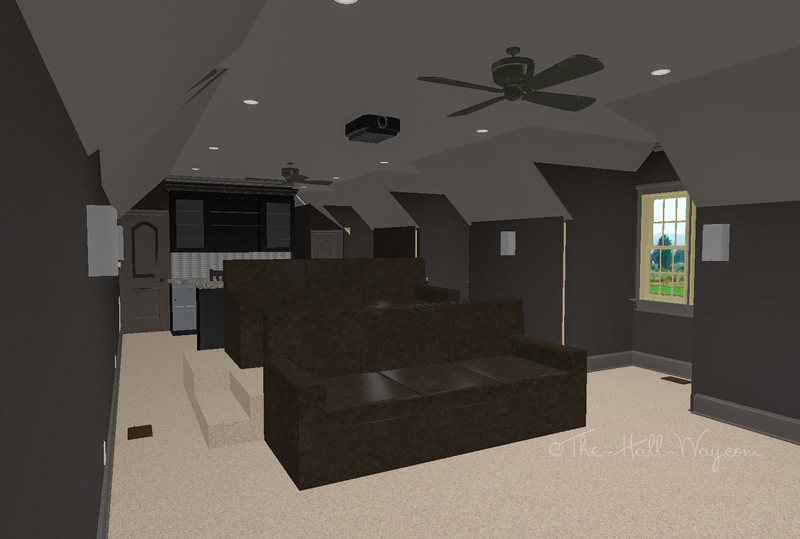 The staircase could use some more lighting, so I’d like to change out the recessed light over the landing to a group of pendants or something similar. Ideally, I’d get rid of the light beige carpet, but it’s still in excellent condition so ripping it out will be hard to justify. My main dilemma is wall colors and whether to have a “theme” or not. We are auto racing fans, so that’s a theme that’s been mentioned. Or, just cars in general. I’ve also considered going with a rustic vibe. Or, it will most likely just end up being a non-themed room like the rest of the house. I would like to do something fun to the bathroom. We shall see.